Our staff provide the expertise to get CNTs working for you today, not tomorrow. Carbon nanotubes (CNTs) are among the most important raw materials for use in tomorrow’s products. 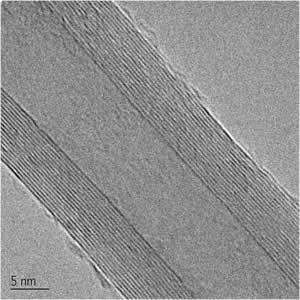 They pack the conductivity and strength of graphene sheets within nanoscale cylinders exhibiting extreme length-to-diameter aspect ratios. As such, CNTs are poised to continue impacting the materials, electronics, medical and energy sectors. Don’t be left behind. The SSP-354 is a simple to use chemical vapor deposition system providing you full control of the growth parameters for your desired CNTs. With just a single feedstock, high quality CNTs are grown on a quartz substrate that can reused over and over again. Our patented process employs an organometallic precursor that supplies catalytic nuclei necessary for CNT synthesis. Simply load the injector and press start; a carrier gas and adjustable thermal gradient provide the optimal conditions for vapor diffusion and growth within the hottest region of the instrument. No more catalyst pre-deposition. No more expensive substrate preparation. Our system also alleviates the time and effort typically required for post-growth purification. Raw CNTs prepared by the SSP-354 are low in residual catalyst and amorphous carbon impurities, as demonstrated by thermogravimetric analysis, Raman spectrometry and electron microscopy. Our staff provide the expertise to get CNTs working for you today, not tomorrow. Get started on your project with high quality CNTs. The SSP-354 produces as grown CNT with less than 4% catalyst impurity and low defect density (less than 2% amorphous carbon).